Three times now it has happened that I can vividly remember, three times we have witnessed Shay Given reduced to tears on a football pitch. Twice, in hindsight, it was meaningless. The first time was in the Heysel Stadium in Brussels many moons ago when Mick McCarthy was still Ireland manager and hosts Belgium were the opponents in the second leg of the 1998 World Cup playoffs. Ireland were beaten 2-1 on the night, 3-2 on aggregate, and a very young Newcastle United goalkeeper from Donegal left the arena in floods of tears. I can’t remember if Shay cried the day the World Cup dream died again in 2002, this time in the finals themselves and this time to Spain in that infamous shoot-out in Suwon. I know he definitely cried, as much with anger and frustration as sorrow, the night Thierry Henry cheated his way to the World Cup finals in Paris two years again. But again that now seems absolutely irrelevant. Shay Given bawled his eyes out on a football pitch last Sunday afternoon. He couldn’t stop the tears flowing down his Aston Villa jersey at the Liberty Stadium in Swansea. And that was before a ball was even kicked in the first Premier League game of what Sky likes to call a Super Sunday. Given’s tears had nothing to do with football really last Sunday, and yet they had everything to do with the game so many of us hold so dear. The Donegal man, Ireland’s record caps holder and our first goalkeeper to play more than 100 games for his country, awoke to some very tragic news on the morning of the Villa-Swansea game. Many miles from Swansea, in a Cheshire village not far from Manchester, a former teammate of Given’s was found dead in his family home. Gary Speed, a very close friend of Shay’s from their time together at Newcastle United, should have had everything going for him last Sunday morning. On Saturday afternoon the former Leeds, Everton, Newcastle, Bolton and Sheffield United midfielder was all laughs and all smiles when he appeared alongside Gary McAllister on one of the BBC’s many excellent football shows. A few days earlier he was the manager in the dugout as a Welsh team enjoying something of a revival saw off Norway 4-1 in a friendly international in Cardiff. A month or so ago, Speed was in charge of the same Wales team that deserved something from their Euro 2012 game against England at Wembley. 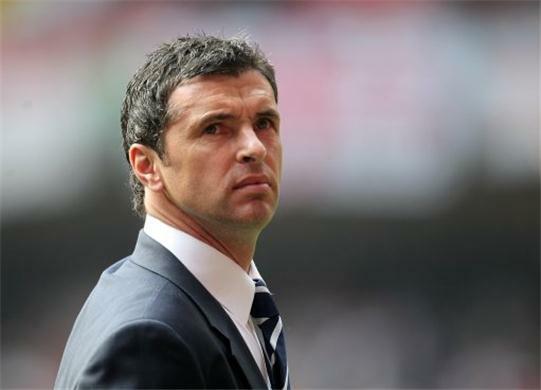 Yet Gary Speed ended his own life somewhere between Saturday night and early Sunday morning when his body was found in the home he shared with his wife and their two young children. His former Newcastle teammate Given learned of Speed’s death in an early phone call from another good friend, the Geordie legend Alan Shearer. Given opted to play on. Welsh striker Craig Bellamy couldn’t bring himself to play for Liverpool in their 1-1 draw with Manchester City later that same afternoon. The Liverpool manager Kenny Dalglish helped Bellamy make the decision to go home and attempt come to terms with his grief. King Kenny told reporters afterwards that there is no comparison between grieving and a game of football on the scale of a man’s priorities. He was right. As Shay Given and Craig Bellamy and the majority of sensible football folk discovered with the news of Gary Speed’s death last Sunday, it is only a game. Football isn’t worth a single tear but Shay was right to cry a river last Sunday. His friend deserved that much. SOCCER: Some first impressions of Kiev ahead of Friday’s Euro 2012 draw. It’s smoky -- there’s no smoking ban in the hotels and bars and the place stinks of tobacco smoke. It’s busy -- the traffic in from the airport was chaotic on Tuesday and the road isn’t finished yet. It’s booming -- there are actually builders and cranes working in Kiev, just like the old Celtic Tiger days in Dublin. It’s friendly -- the people are keen to make you feel welcome, and they all say they’d love to have Ireland here next summer, but I’ve a feeling the fans would be better off in Poland. And finally -- it’s dated. They seem to love the eighties here. Whitesnake were here last week and Roxette are playing here next Tuesday. I can’t wait for their gig by the way. It must have been love -- but it’s over now! Sorry…. SOCCER: Anthony Stokes has attracted attention for all sorts of reasons in the recent past, but the Celtic striker doesn’t deserve to have the windows in his home smashed by sectarian yobs. The fact that his pregnant girlfriend was in the house on her own at the time makes this story all the more worrying and harrowing. SOCCER: Best of luck to Pat Fenlon in his new job as manager of Scottish side Hibs. Nutsy, as he is known, has already proven himself in the goldfish bowl that is Irish football with both Shels and Bohs. There’s little doubt he will be a success in Scotland as well. And that can only reflect well on the League of Ireland. SOCCER: Giovanni Trapattoni says he will keep his promise to climb Croagh Patrick on the back of Ireland’s Euro 2012 qualification. He wants to keep his pilgrimage quiet. I wish him well with that one. Word will spread the minute he lands in Mayo. Just watch. IT took a lot for Shay Given to play a football match on Sunday just hours after he learned of the death of his close friend Gary Speed. Ireland’s number one was professional to the last though as Aston Villa drew with Swansea City at the Liberty Stadium on a day when football was irrelevant. That he produced a world class save near the end to deny Swansea a winner was as fitting a tribute to his friend as his tears before the game. JOEY Barton, once of Newcastle United but now of QPR, is an idiot. I know it’s not the first time we’ve said it on this page, but his decision to publicly berate those mourning Gary Speed this week defied all logic. That’s one twitter account that should be closed down. And quickly.